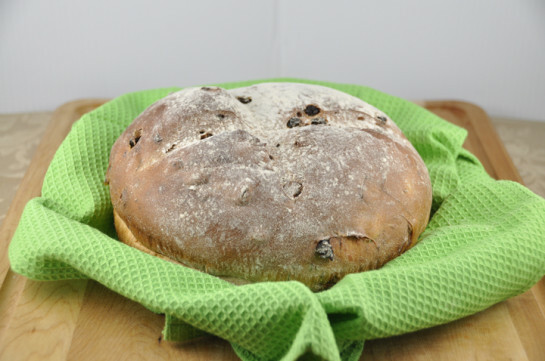 Irish Raisin Soda Bread Recipe quick bread recipe tastes like something straight out of a bakery and is perfect to celebrate St. Patrick's Day! Preheat the oven to 375 degrees F. Line a sheet pan with parchment paper (can also use a round cake or pie pan, like I did). Combine the flour, sugar, baking soda, and salt in the bowl of an electric mixer fitted with the paddle attachment. Add the butter and mix on low speed until the butter is mixed into the flour. With a fork, lightly beat the buttermilk, egg, and orange zest together in a bowl. With the mixer on low speed, slowly add the buttermilk mixture to the flour mixture. Combine the raisins/currants with 1 tablespoon of flour and mix into the dough (this will keep them from sinking during baking). It will be very wet. Dump the dough onto a well-floured surface and knead it a few times into a round loaf. Place the loaf on the prepared sheet pan and lightly cut an X into the top of the bread with a serrated knife. Bake for 45 to 55 minutes, or until a cake tester comes out clean (mine took closer to 55). When you tap the loaf, it should have a hollow sound. Cool on a baking rack. I dusted the top with Rye flour to make it look nicer (optional). Serve warm or at room temperature.